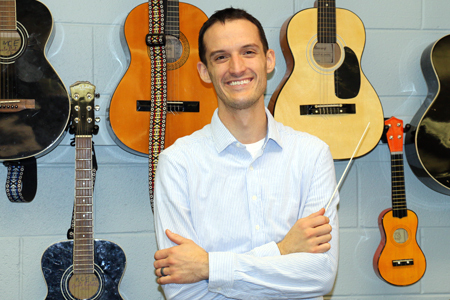 Hello, I am Mr. Pichette and welcome to music class. Here are at Madison Campus Elementary we offer a wide variety of musical opportunities. From Prekindergarten to 8th grade, students engage in classroom music, recorders, beginning band, concert band, concert choir and hand chimes. On top of the standard classes, private lessons are also available. Throughout the year, students perform at local churches and area venues. Students in 6th-8th grade also participate in a conference-wide 3-day music festival. All music studied, is aimed at developing a well rounded musician, with a balance of secular and sacred repertoire. Grab an instrument, lift your voice and come to music class where we learn to create music that glorifies God.